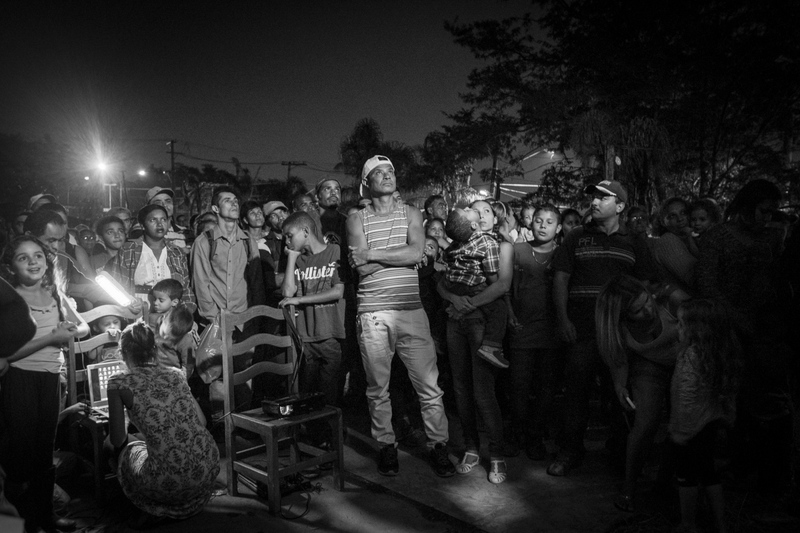 Even if football was born in England, Brazil is considered the spiritual home of the game. During a month, from the 12th June 2014, the world will be looking to the South American nation and follow with passion the matches on the pitch. Brazil has always been known by its football skills, beautiful beaches and eclectic music but also for its social inequalities. While some people will be able to enjoy the games on brand new million worth stadiums, others are literally struggling just put a roof over their head. Three kilometres from the Arena Corinthians in São Paulo, which will host the opening match, nearly 5,000 families live in small shacks made of wooden poles and plastic garbage bags. Most of them were made homeless after the sky rising prices on the rents of their houses because of the FIFA World Cup. 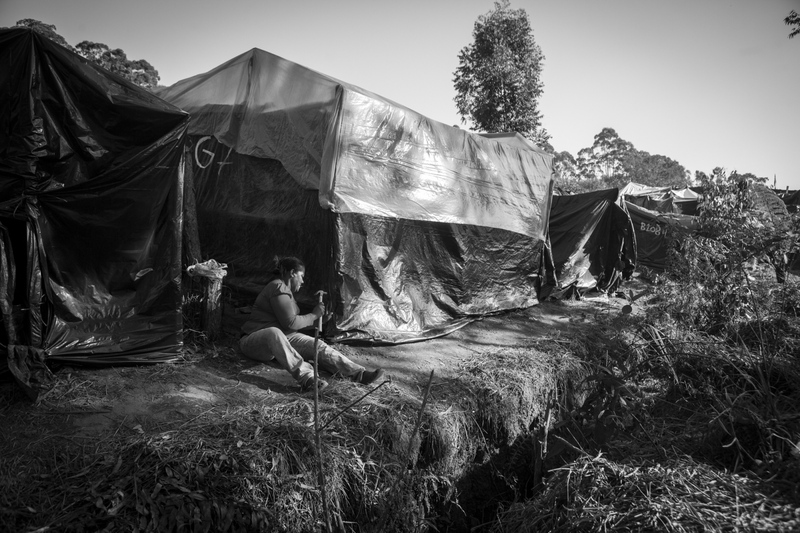 With the help of the Movimento de Trabalhadores Sem Tecto – MTST (Movement of Workers Without Ceiling), people have occupied a piece of land that was previously without use and settled a camp to live with their families. The camp is named Copa do Povo (People’s Cup). People living here believe with the proximity of the Stadium and the competition, their voice will be heard and the situation resolved. They say, “If there is millions for Stadiums, there should be money to house the most needed”. The movement say they’re not against the FIFA World Cup, they love the game and will support their national team - but they also want a home. 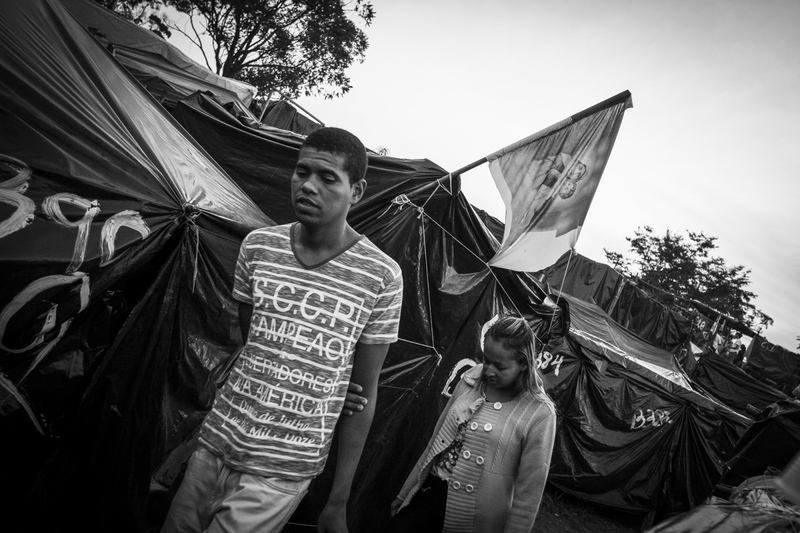 People living in Copa do Povo (People's Cup) Camp pass in front of a shack with a flag with Jesus and Maria. Even after all adversity people didn't lost their faith. The Copa do Povo Camp, is just a few miles from the Arena Corinthians and has 5,000 homeless workers and their families occupied area of fifteen acres. They are homeless after rents skyrocketed because of the World Cup. Overview of part of the Copa do Povo (People's Cup) Camp in Itaquera, São Paulo. The Copa do Povo Camp, is just a few miles from the Arena Corinthians and has 5,000 homeless workers and their families occupied area of fifteen acres. They are homeless after rents skyrocketed because of the World Cup. 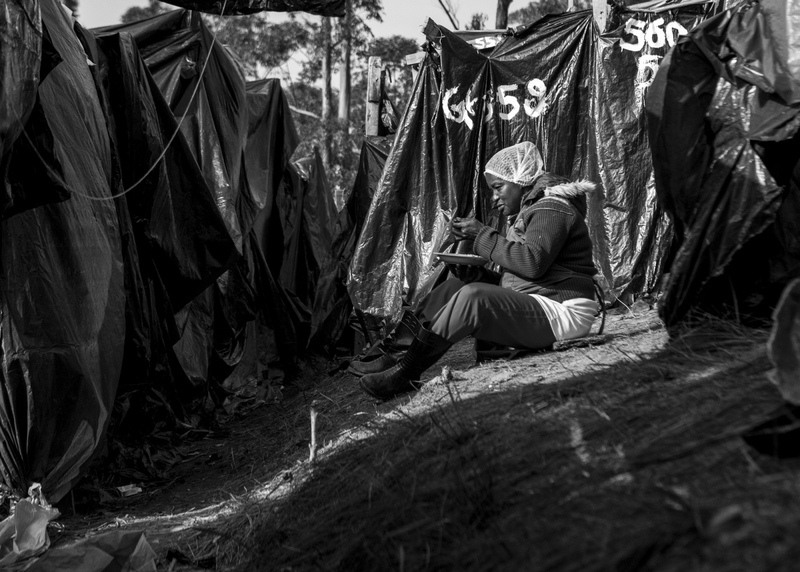 A woman reinforces her shelter putting more nails in the structure on the Copa do Povo (People's Cup) Camp in Itaquera, São Paulo. The Copa do Povo Camp, is just a few miles from the Arena Corinthians and has 5,000 homeless workers and their families occupied area of fifteen acres. They are homeless after rents skyrocketed because of the World Cup. 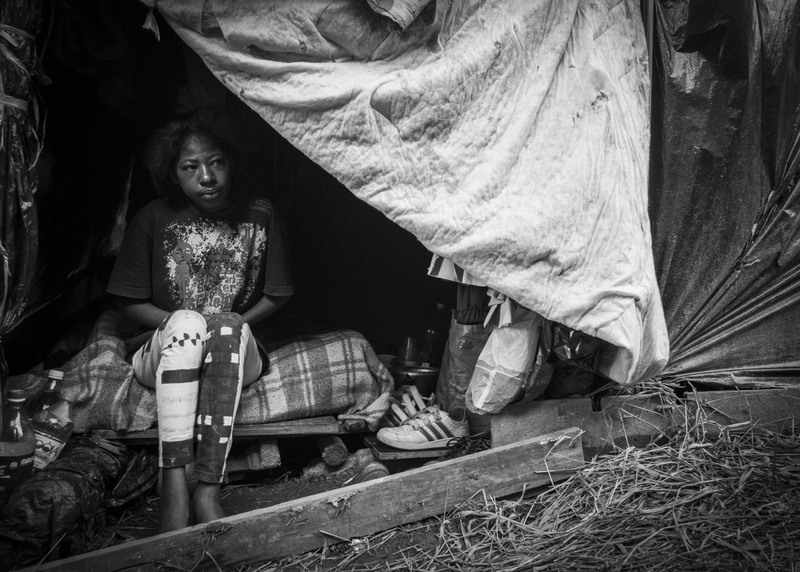 Claudineia Silva, 33, used to live with her mother but after the prices skyrocked because of the World Cup she was forced to move to the Copa do Povo (People's Cup) Camp in Itaquera, São Paulo. Her mother lives now with the brothers that she doesn't get along. The Copa do Povo Camp is just a few miles from the Arena Corinthians and has 5,000 homeless workers and their families occupied area of fifteen acres. They are homeless after rents skyrocketed because of the World Cup. 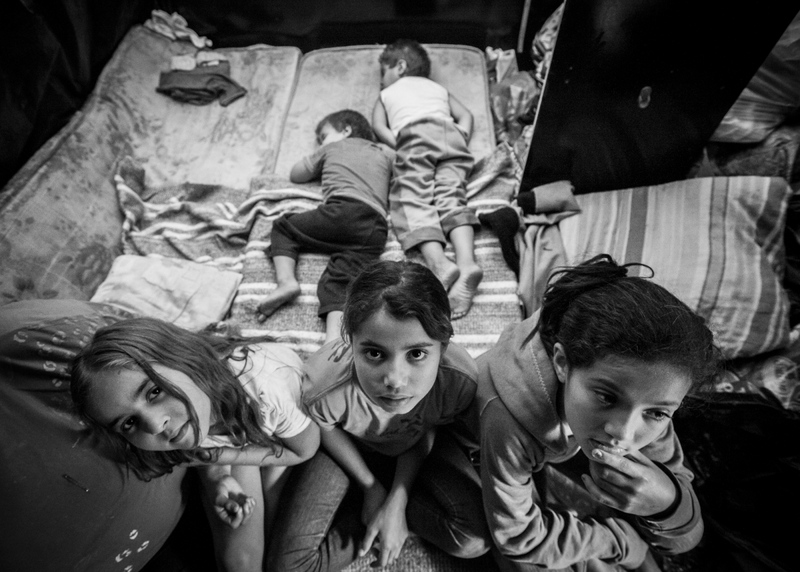 Five of the 6 children of Glauce that lives in a shelter of eight square meters with her six children - and mom in the Copa do Povo (People's Cup) Camp in Itaquera, São Paulo. The Copa do Povo Camp, is just a few miles from the Arena Corinthians and has 5,000 homeless workers and their families occupied area of fifteen acres. They are homeless after rents skyrocketed because of the World Cup. 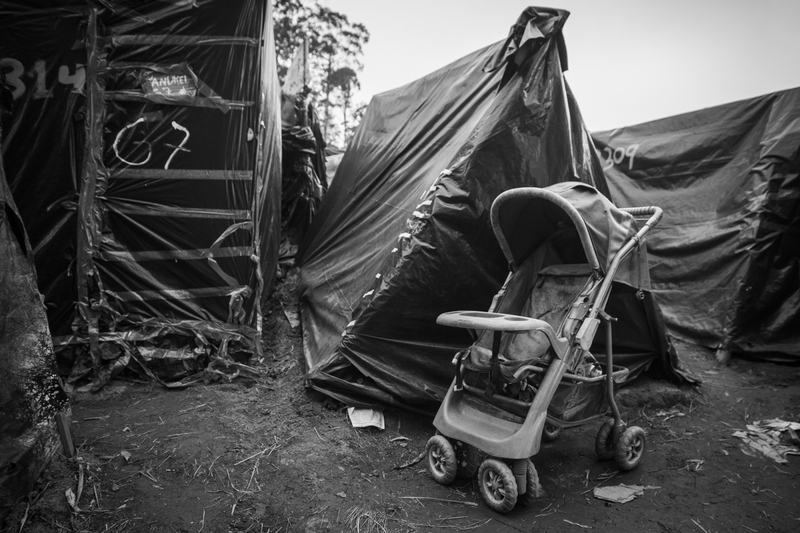 A baby kart outside one of the tents where lives a family in Copa do Povo (People's Cup) Camp in Itaquera, São Paulo. The Copa do Povo Camp, is just a few miles from the Arena Corinthians and has 5,000 homeless workers and their families occupied area of fifteen acres. They are homeless after rents skyrocketed because of the World Cup. Teenagers hangout in one of the shelters in Copa do Povo (People's Cup) Camp in Itaquera, São Paulo. 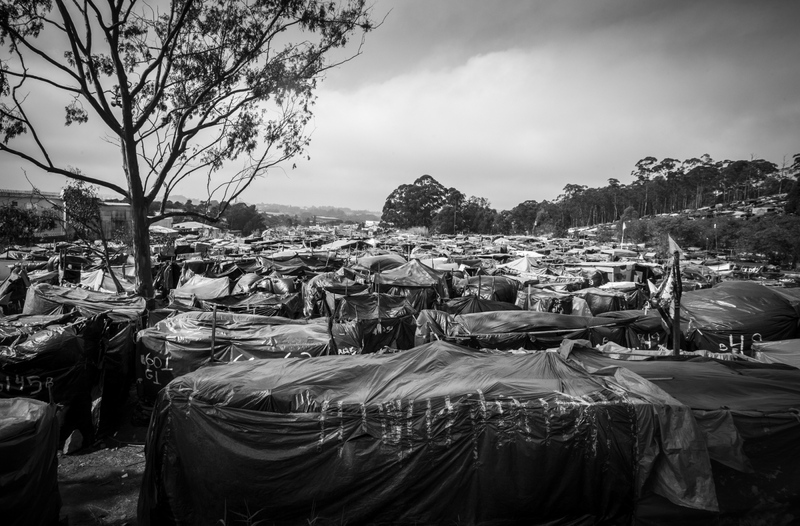 The Copa do Povo Camp, is just a few miles from the Arena Corinthians and has 5,000 homeless workers and their families occupied area of fifteen acres. They are homeless after rents skyrocketed because of the World Cup. 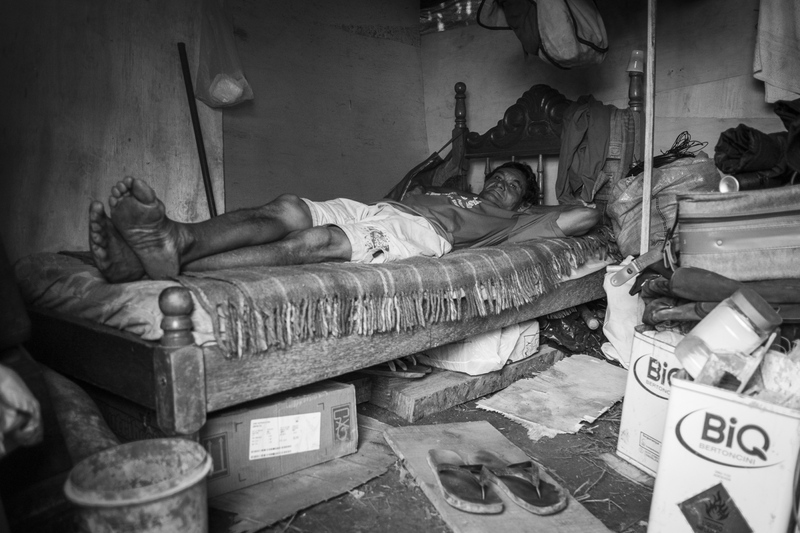 Pedro Pereira, a construction worker, was expelled from his previous shelter by drug lords in Vila Matilde and he made his home in a shack in Copa do Povo (People's Cup) Camp, Itaquera, São Paulo. He claims police doesn't do anything and he hopes the government can give him a small place where he can live with dignity. 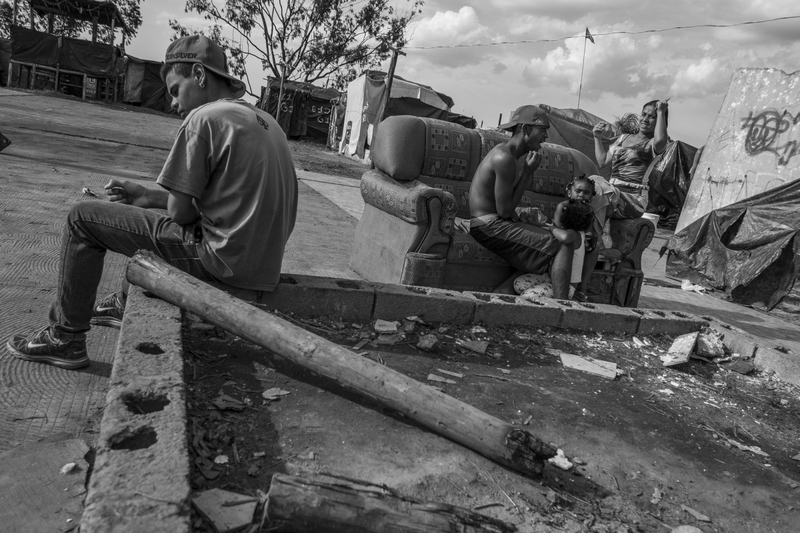 The Copa do Povo Camp, is just a few miles from the Arena Corinthians and has 5,000 homeless workers and their families occupied area of fifteen acres. They are homeless after rents skyrocketed because of the World Cup. 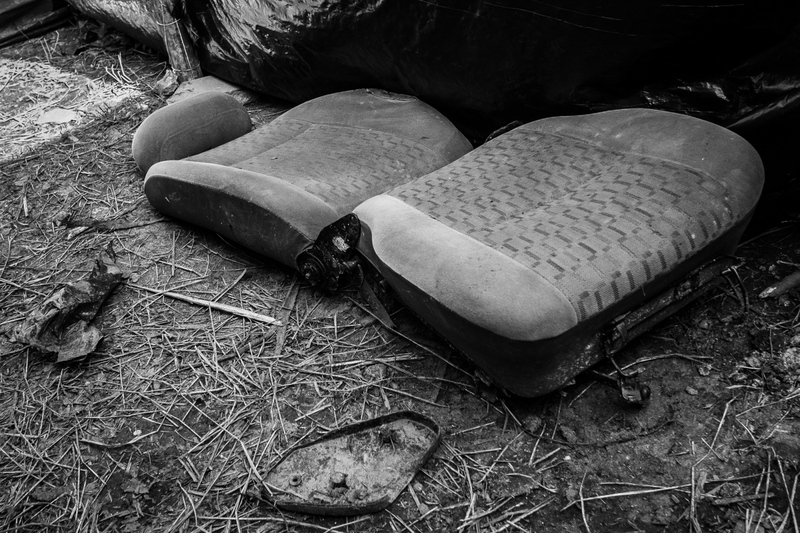 A car seat that serves as a bed inside one of the shelters in the Copa do Povo (People's Cup) Camp in Itaquera, São Paulo. The Copa do Povo Camp, is just a few miles from the Arena Corinthians and has 5,000 homeless workers and their families occupied area of fifteen acres. They are homeless after rents skyrocketed because of the World Cup. Communal kitchen in the Copa do Povo (People's Cup) Camp in Itaquera, São Paulo. 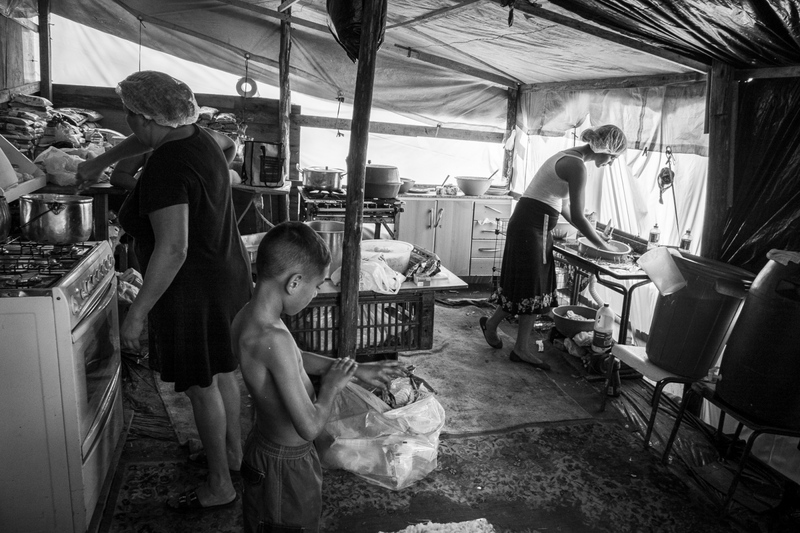 There are eight communal kitchens around the camp where food is provider for all the habitants. It run for some of the homeless and volunteers and they get the food by donation. 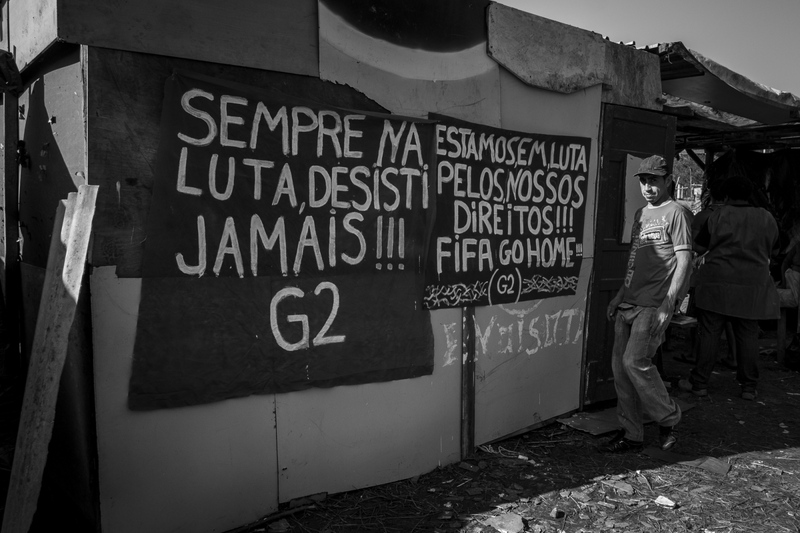 The Copa do Povo Camp is just a few miles from the Arena Corinthians and has 5,000 homeless workers and their families occupied area of fifteen acres. They are homeless after rents skyrocketed because of the World Cup. A woman eats between the shacks made of wooden sticks and black plastic bags on the Copa do Povo (People's Cup) camp, Itaquare, São Paulo. The Copa do Povo Camp, is just a few miles from the Arena Corinthians and has 5,000 homeless workers and their families occupied area of fifteen acres. They are homeless after rents skyrocketed because of the World Cup. Banners hanging on the wall of the meeting center of group 1 in the Copa do Povo (People's Cup) Camp in Itaquera, São Paulo. The banners were prepared for the demonstration that took 20,000 people tho the streets. The Copa do Povo Camp, is just a few miles from the Arena Corinthians and has 5,000 homeless workers and their families occupied area of fifteen acres. They are homeless after rents skyrocketed because of the World Cup. 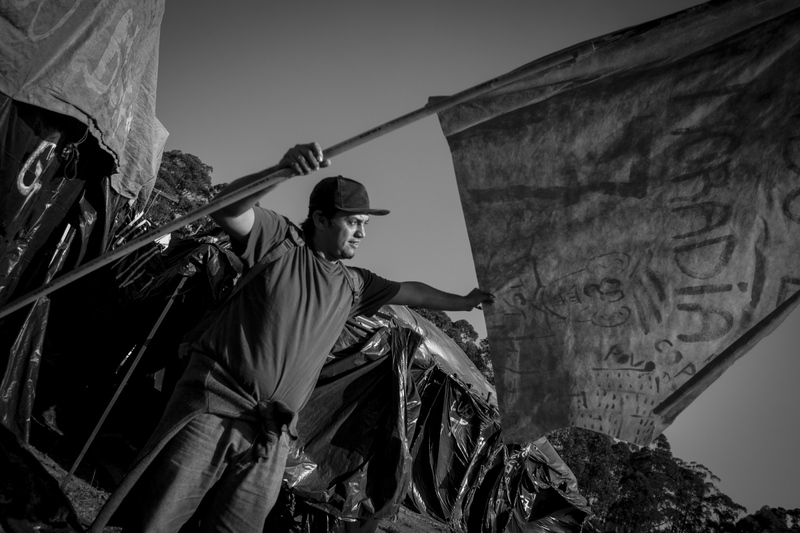 A member of the Movement of Workers Without Ceiling (MTST) prepares a flag for the protest demanding for housing not only for the residents of Copa do Povo but also for other camps around the city of São Paulo. The Copa do Povo Camp, is just a few miles from the Arena Corinthians and has 5,000 homeless workers and their families occupied area of fifteen acres. They are homeless after rents skyrocketed because of the World Cup. 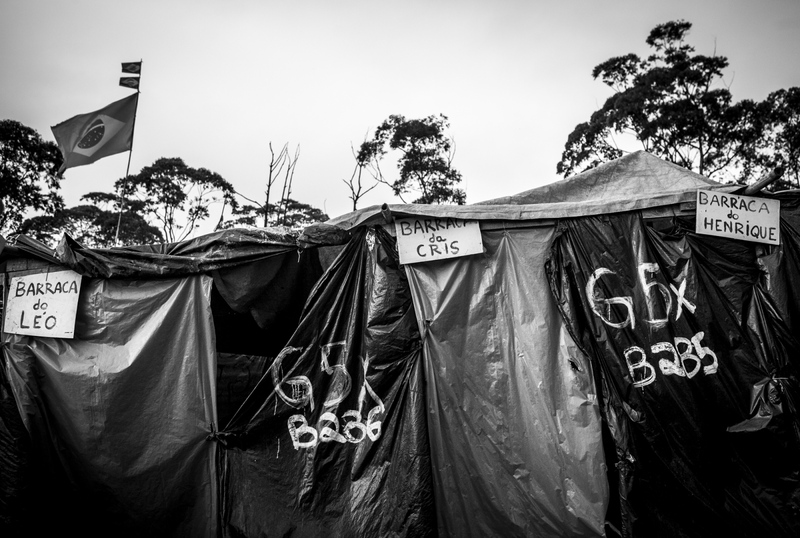 Tents in Copa do Povo (People's Cup) Camp in Itaquera, São Paulo, are organized by groups and have a respective number but people give the name of their family name to have a better felling of home. 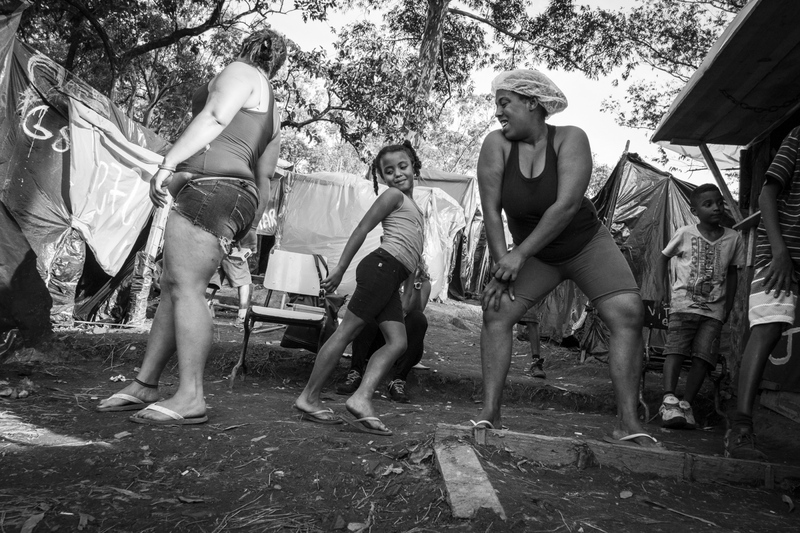 The Copa do Povo Camp, is just a few miles from the Arena Corinthians and has 5,000 homeless workers and their families occupied area of fifteen acres. They are homeless after rents skyrocketed because of the World Cup. 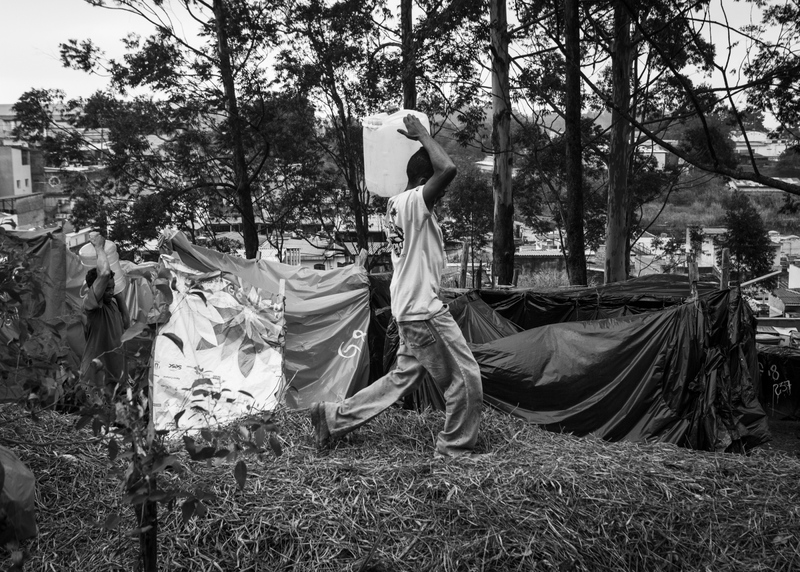 Men carry water to their camp in the Copa do Povo (People's Cup) Camp in Itaquera, São Paulo. The Copa do Povo Camp, is just a few miles from the Arena Corinthians and has 5,000 homeless workers and their families occupied area of fifteen acres. They are homeless after rents skyrocketed because of the World Cup. Habitants of Copa do Povo (People's Cup) Camp hang out in the communal square in front of the Camp, Itauquera, São Paulo. The Copa do Povo Camp, is just a few miles from the Arena Corinthians and has 5,000 homeless workers and their families occupied area of fifteen acres. They are homeless after rents skyrocketed because of the World Cup. A woman teaches a child to dance Brazilan Funk in Copa do Povo (People's Cup) camp in Itaquera, São Paulo. The Copa do Povo Camp, is just a few miles from the Arena Corinthians and has 5,000 homeless workers and their families occupied area of fifteen acres. They are homeless after rents skyrocketed because of the World Cup. 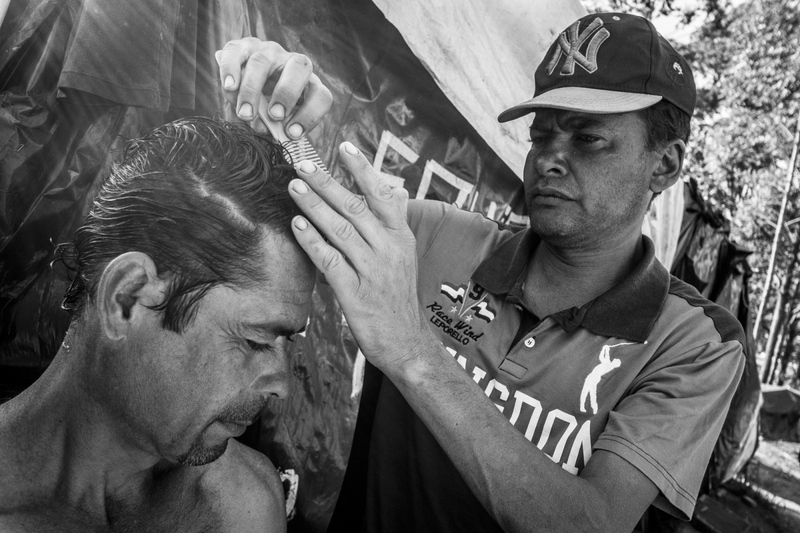 Roberto Marquez, 41, has his hair cutted by his friend. Roberto lives in a a small shelter in the Copa do Povo (People's Cup) Camp in Itaquera, São Paulo. After he lost his job he was unable to pay rent so he got help from the MTST and moved to the camp. Now he is one of the people responsible for the kitchen of Group 6. The Copa do Povo Camp, is just a few miles from the Arena Corinthians and has 5,000 homeless workers and their families occupied area of fifteen acres. They are homeless after rents skyrocketed because of the World Cup. 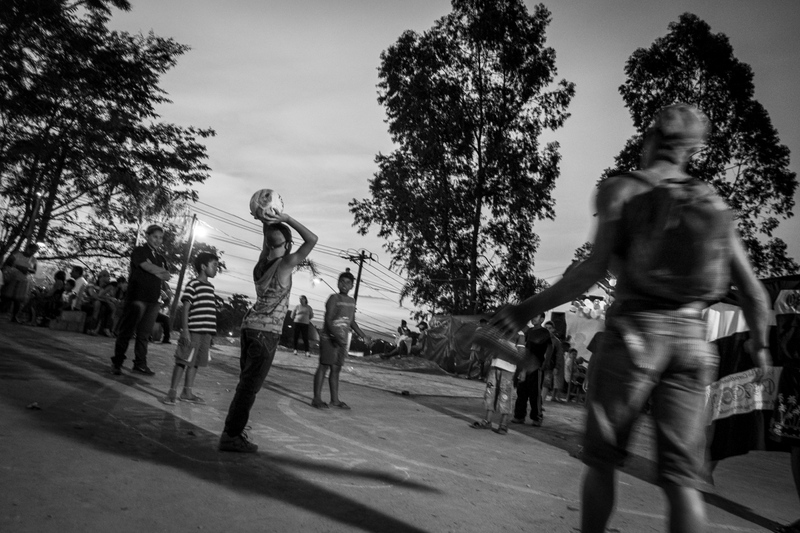 Ceará Machado plays football with his friends in front of the Copa do Povo (People's Cup) Camp in Itaquera, São Paulo. Even if the World Cup is the main reason to be without a roof he still loves the game and will suppport Brazil to lift the cup. The Copa do Povo Camp, is just a few miles from the Arena Corinthians and has 5,000 homeless workers and their families occupied area of fifteen acres. They are homeless after rents skyrocketed because of the World Cup. 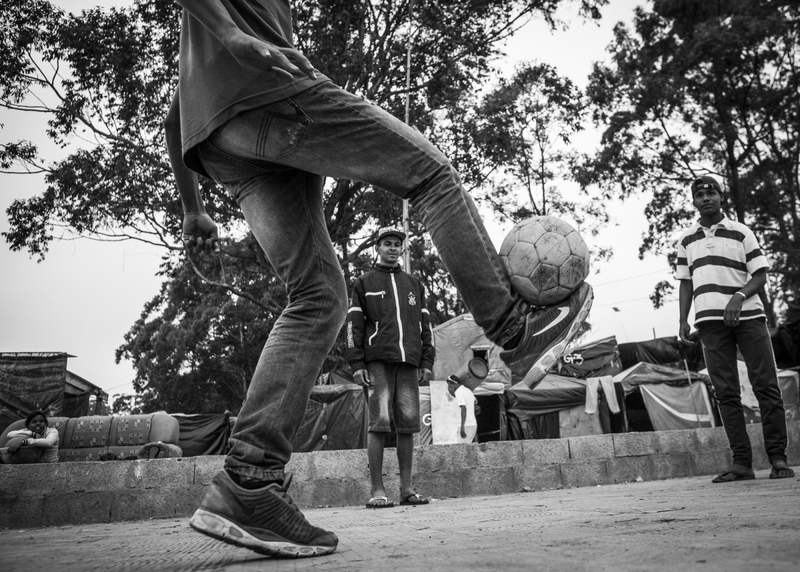 Children play football in the communal square of the Copa do Povo (People's Cup) camp, Itauquera, São Paulo.The Copa do Povo Camp, is just a few miles from the Arena Corinthians and has 5,000 homeless workers and their families occupied area of fifteen acres. They are homeless after rents skyrocketed because of the World Cup. Habitants of Copa do Povo (People's Cup) Camp, Itaquera, São Paulo, listen to the leaders of the Movement of Workers Without Ceiling (MTST) while they explain the negociations with the Brazilian Government. Every night they gather for debates and to coordinate the efforts to run the camp. 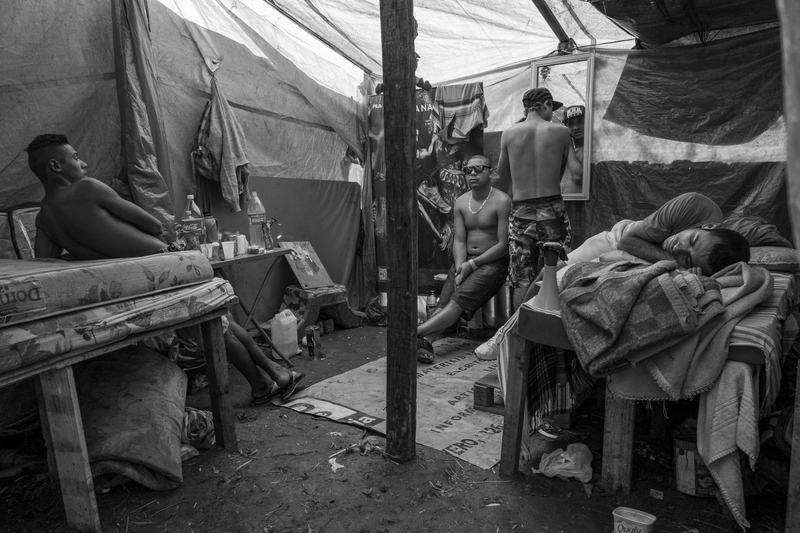 The Copa do Povo Camp, is just a few miles from the Arena Corinthians and has 5,000 homeless workers and their families occupied area of fifteen acres. They are homeless after rents skyrocketed because of the World Cup.